Our paper on ArbAlign is published here. Our group hosted the 15th MERCURY conference for computational chemistry at Bucknell. Our group hosted the 14th MERCURY conference for computational chemistry at Bucknell. Aside from my research and mentoring roles, I have been managing and maintaining MERCURY consortium's high performance computing (HPC) resources as a system adminstrator along with Steve Young at Hamilton College since 2010. In that role, I provide technical research support to MERCURY users and promote the use of HPC in chemistry and other fields. MERCURY consortium members share high performance computing (HPC) facilities to advance their research. Haystack (2009-2013) was an SGI BX2 3700 shared memory machine. 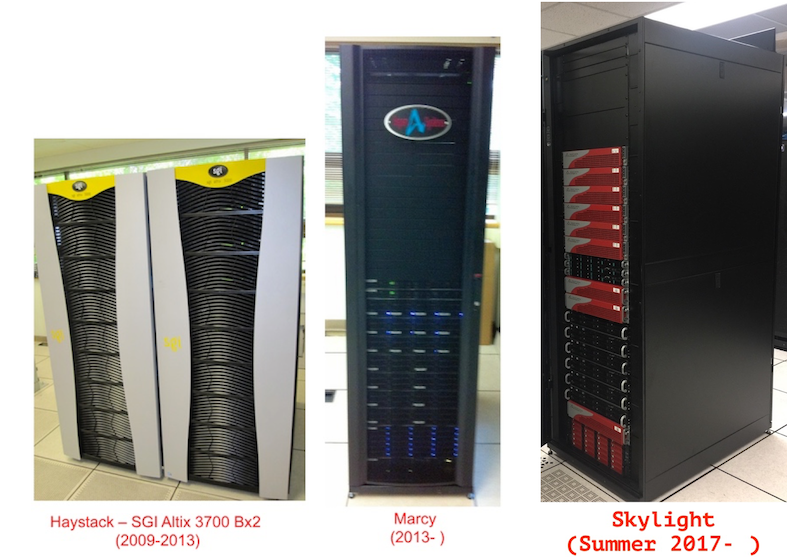 After it was decommissioned, a Linux cluster named Marcy is hosted at Bucknell/Furman University took over and it has been in full production since May 2013. Our newest and most powerful cluster is Skylight and it has been in full production since June 2017. We have had yearly allocations at various NSF-TeraGrid/XSEDE's facilities since 2009. XSEDE is an open scientific discovery infrastructure combining leadership class resources at eleven partner sites to create an integrated, persistent computational resource. Using high-performance network connections, the XSEDE integrates high-performance computers, data resources and tools, and high-end experimental facilities around the country. Currently, XSEDE resources include more than a petaflop of computing capability and more than 30 petabytes of online and archival data storage, with rapid access and retrieval over high-performance networks. Researchers can also access more than 100 discipline-specific databases. With this combination of resources, the XSEDE is the world's largest, most comprehensive distributed cyberinfrastructure for open scientific research. We have had yearly allocation to use DOE's NERSC computing facilities.